DE WIT -Septemtrionaliora Americae a Groenlandia, per Freta Davidis et Hudson, ad Terram Novam. DE WIT - Septemtrionaliora Americae a Groenlandia, per Freta Davidis et Hudson, ad Terram Novam. Title : Septemtrionaliora Americae a Groenlandia, per Freta Davidis et Hudson, ad Terram Novam..
Map maker : DE WIT. Size : 19.4 x 22.6 inches. / 49.3 x 57.4 cm. 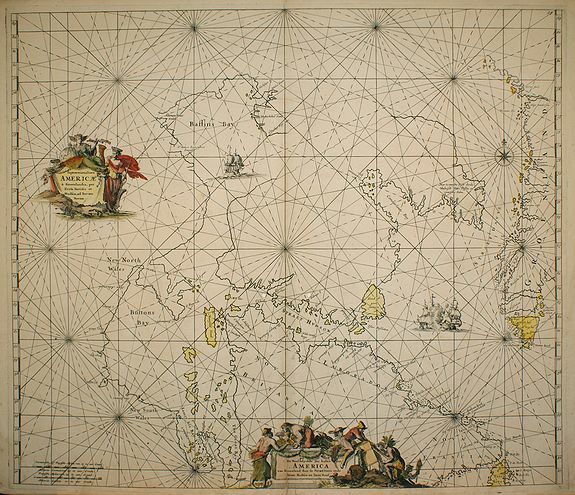 Description :Chart of Hudson Bay and Arctic Canada, from Wit's Orbis Maritimus ofte Zee Atlas, published in 1680 in Amsterdam. The chart shows some of the earliest, tentative mapping of the region. Based on Van Loon's earlier chart of 1666, it includes Hudson Bay and Hudson Strait, Baffin Bay, an enlarged Baffin Island, James Bay and Buttons Bay, and across the sea to the western coast of Greenland. The chart shows an erroneous second bay next to James Bay named The Great Bay. The handcolored chart is richly embellished with rhumb lines and two elaborate cartouches, one in Latin and one in Dutch. It depicts a sea battle near Hudson Strait and another ship sailing in Baffin Bay. Condition : The centerfold has been repaired at the bottom of the map. Short lower margin. For the rest, in good condition.